The Uplands are located between Bathurst Street and Yonge Street. It is north of Centre Street and south of Highway 407. 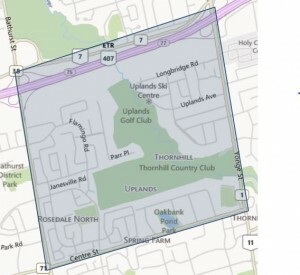 The Uplands belong to the municipality of Vaughan, Ontario. One of the benefits of the Uplands is the fact that it is conveniently located for transportation and shopping. There is easy access to Highway 407, Highway 7, Yonge Street, the “VIVA” buses, and Bathurst Street. You are within close proximity to shopping malls, restaurants, and cafeterias. By living in the Uplands, you have all the benefits of living within the city, while simultaneously enjoying the benefits of residing in a quiet, safe, neighborhood. This means that you ultimately have the best of both worlds. The Uplands area is booming with the construction of new homes. You will find that upwards of 50 percent of the homes have been rebuilt as of 2013. You will predominantly find two different types of homes in the Uplands, old homes below $2,000,000, and new homes above $2,000,000. The statistics even reveal that in 2012, the most expensive home sold for around $6,000,000. There are plenty of homes with massive luxury lots in a few of the more expensive streets; these include Elmbank Road, Thornbank Road, Parr Place, Riverside Blvd, and Oakbank Road. For those who want luxury living in the heart of the city, the Uplands are certainly a dream neighborhood. There are also more affordable, older homes available at Chilmar Cres, Roxborough Lane, Glen Cres, Rosedale Heights Drive, Longbridge Road, Flamingo Road, and Rose Green Drive. These homes typically start at $650,000 and go up to $2,000,000. Previous post: How does the Power of Sale process influence you as a buyer?